Below are links to the individual reviews I did for this set. Overall, I love the colors, and the formulas are on par with polishes from OPI’s permanent range. The biggest drawback to this set is the small brushes. If you have a small or narrow nail bed, this will not be much of a problem. I found that the key to working with the smaller brush is to allow the bristles to flare out as much as possible, and applying each shade in thin coats. This might increase the time you spend applying these colors, but will result in a smoother, less streaky finish. If I would have reviewed the full-sized versions of these nail polishes, I believe they all would have received higher ratings. Personally, I will not be purchasing anymore mini sets of nail polish. It is too much of a hassle for me to work with a smaller brush. I hope you enjoy these reviews! Please let me know if you have any questions. 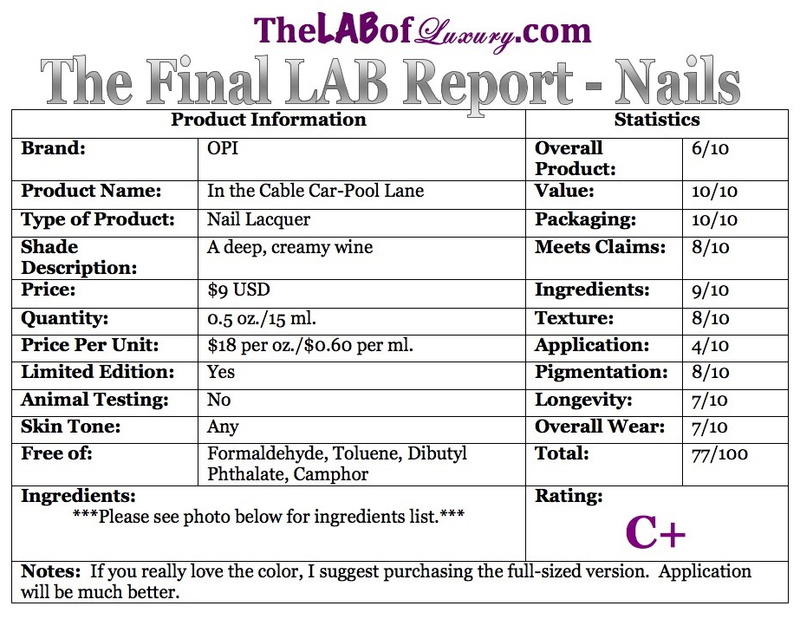 Click on the links below to read the full reviews! 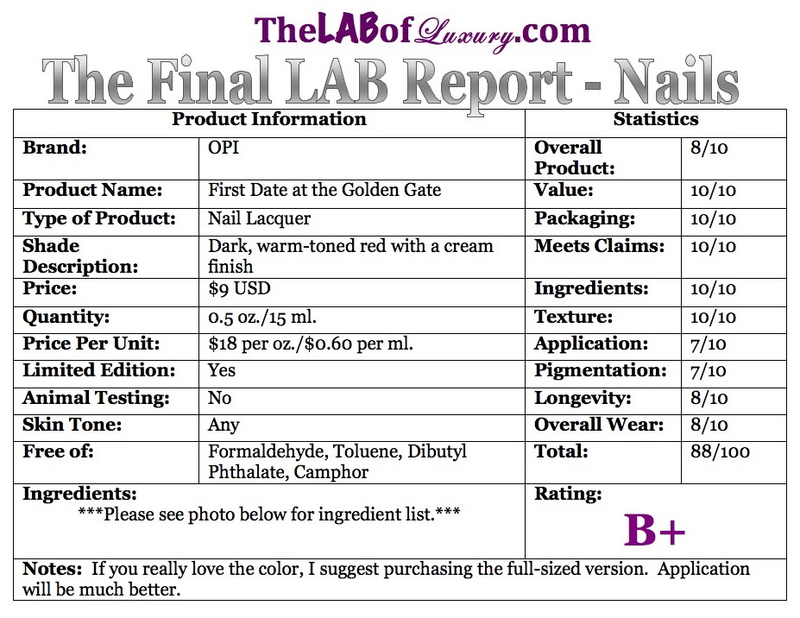 OPI First Date at the Golden Gate (Mini set: $12.95 USD for 0.5 oz./15 ml. ; Full size: $9 USD for 0.5 oz./15 ml.) is described as a “shimmery ruby.” First, it has absolutely no shimmer and, second, it is not at all close to a ruby red. It is a dark, warm-toned red with a cream finish. Actually, I find the name of the polish very apropos, as this is very close in color-darker-to The Golden Gate Bridge. Although the application of this shade was a bit easier than the rest of the shades I have reviewed from this set (I finally found a way to work with the small brush), the pigmentation was uneven. It is not too noticeable from afar, but up close you can see minor streaks of darker color. I do not think you will encounter this problem with the full-sized brush. I used OPI Natural Nail Base Coat and Zoya Armor for the top coat and applied three very thin coats of the polish. I had pretty good wear with this color-a week with signs of minor tip wear, but no chipping or peeling. 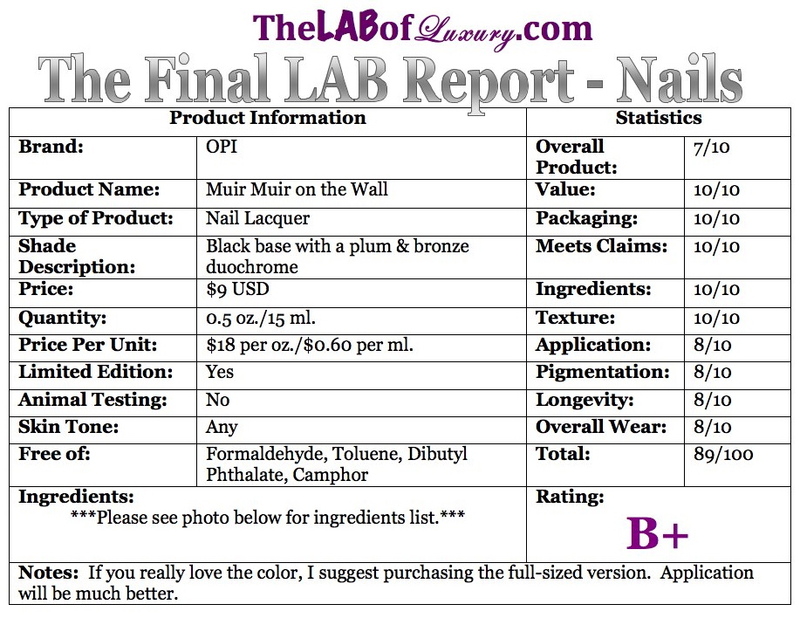 Important Note: The grade for this nail polish is based on the mini size, not the full-sized version. I suspect the full-sized version would yield a smoother application and finish, and a higher rating, due to the larger brush size. 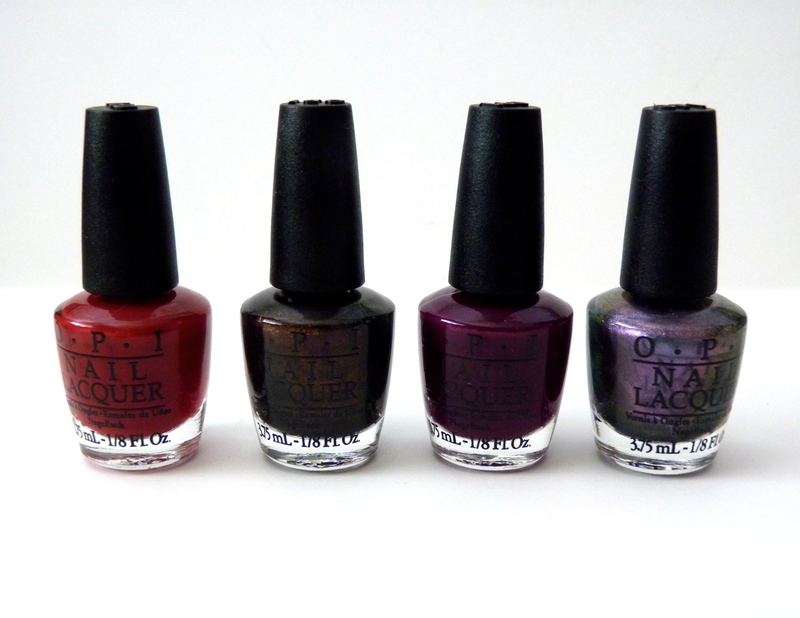 OPI Muir Muir on the Wall (Mini set: $12.95 USD for 0.5 oz./15 ml. ; Full size: $9 USD for 0.5 oz./15 ml.) is simply described as a “trailblazing plum.” It has a black base with a plum and bronze duochrome. Unfortunately, the duochrome is not very visible unless you are looking at the color under bright lighting, or you need to specifically look for the change in color. In general, I do not find this duochrome unique because it mainly looks like a blackened plum. Based on its appearance in the bottle, I expected more. As with the rest of the shades in this San Francisco Mini Set, my main complaint is the small brush. This had sheer application and I used three coats for the swatches. Although, I probably could have applied a fourth coat to achieve a smoother, opaque finish. I used OPI Natural Nail Base Coat and Zoya Armor for the top coat and had average wear with this color-a week with signs of tip wear but no chipping or peeling. 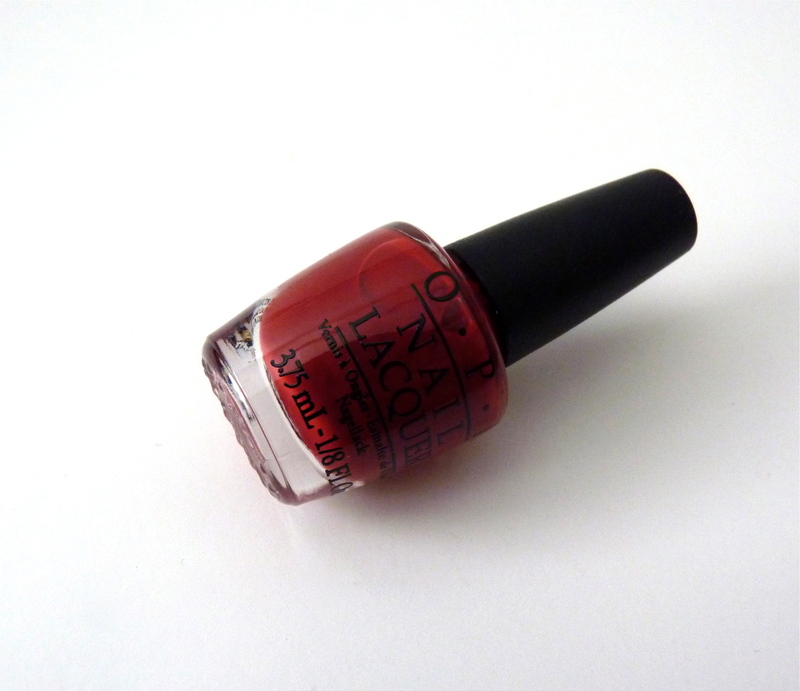 OPI In the Cable Car-Pool Lane (Mini set: $12.95 USD for 0.5 oz./15 ml. ; Full size: $9 USD for 0.5 oz./15 ml.) is described as a “rich burgundy.” It is a beautiful, deep, creamy, wine color that pops against my pale skin. 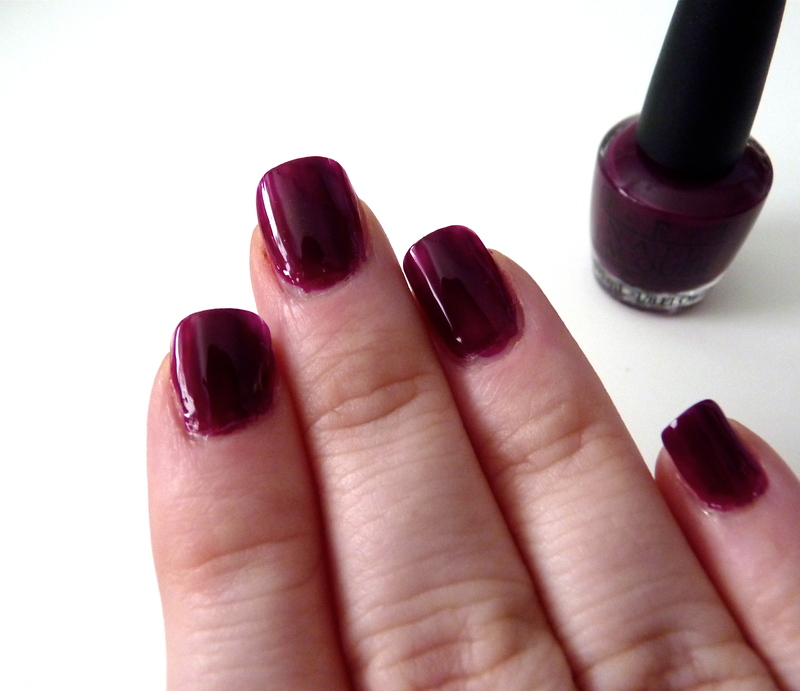 This is a perfect vampy varnish for fall. Unfortunately, I had a really hard time applying this color. The small brush made it impossible to get an even layer on the first try. The texture was a bit on the thin side and you can see from the swatch photos that this did not apply as nicely as it should have. It took three coats (two thin and one thick) and a glossy top coat to achieve a smooth, opaque finish. If you have a relatively narrow nail bed, working with a small brush might not be bothersome. However, if you have a bit of a wide nail bed and longer nails, like I do, then you are better off purchasing the full-sized version. In my opinion, it is not worth trying to fuss with a small brush. It is interesting to note, the first time I tested this polish I used Zoya Anchor and Zoya Armor for the base and top coats. The next day I experienced major chipping, and by the third day the polish peeled right off my left pinky. I retested it using OPI Natural Nail Base Coat and Zoya Armor for the top coat. This resulted in a much longer wear-time, and after seven days there were signs of tip wear, but no major chipping, only minor chipping on a couple of nails. I have used Zoya Anchor with several OPI polishes and have never had any problems with chipping or peeling, so I am not sure why this was not compatible with In the Cable Car-Pool Lane. Not bad, but not the BEST! Currently, I have combination skin that becomes oily during spring/summer and dry during fall/winter. 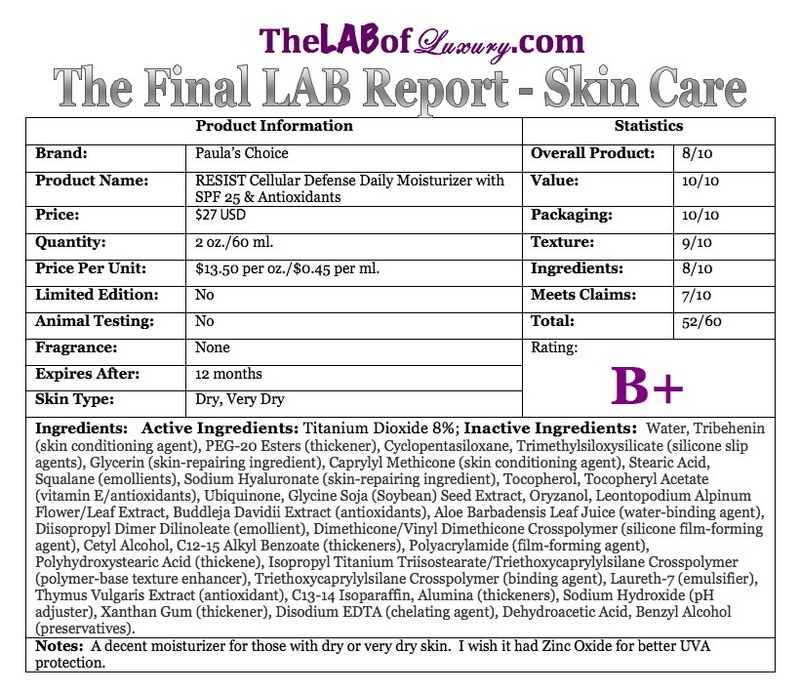 This moisturizer is best suited for those with dry to very dry skin. It is very emollient and conditions the skin well, so those with oily or combination skin will find it too heavy for daily use. The conditioners in this product leave a noticeable sheen on the skin that reads dewy on dry skin and slightly greasy on combination/oily skin. 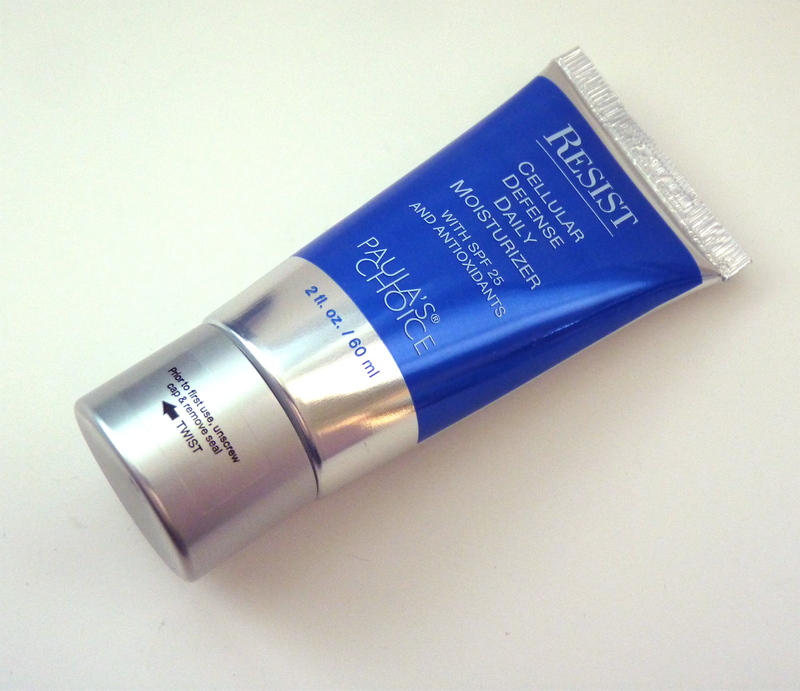 Despite the amount of emollients, this rich moisturizer does not feel greasy or heavy on the skin. After application, I did not feel the need to immediately wash my hands to rid them of any residue. It easily glides across the face, but can leave a white cast on the skin if not thoroughly rubbed in. The silicones in this moisturizer make it a good foundation primer. While using this product my foundation applied smoothly and did not break down throughout the course of the day. This moisturizer’s main drawback is the sole Active Ingredient: Titanium Dioxide. Titanium Dioxide is very effective at screening UVA 2 and UVB rays, but it does not protect against UVA 1 rays. You might remember from my post on Sun Care 101 that UVA 1 rays penetrate the epidermis more deeply than UVA 2 rays. Using Zinc Oxide as a single Active Ingredient, or even combining it with Titanium Dioxide, is highly recommended for the best protection. Overall, this is not a bad product. I have seen much worse at higher price points. Does this product meet all of its anti-aging claims? In a sense, yes. Can it be improved to more effectively prevent signs of aging? Yes! The inclusion of Zinc Oxide as an Active Ingredient, a little less concentration of emollients, and a little higher concentration of antioxidants would make this a stellar product. For now, there are better products on the market, even from Paula’s Choice!